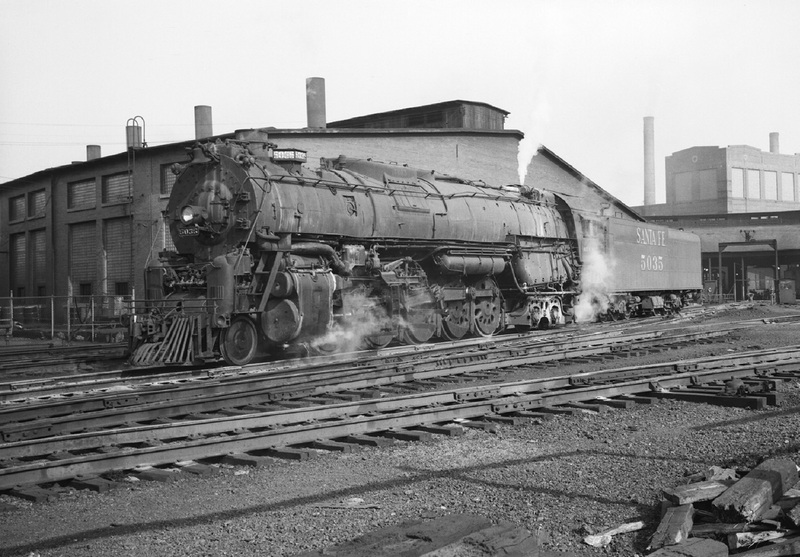 The Pennsylvania Railroad was the largest railroad in Columbus with the most rail yards, the most trains and shops second only to the PRR shops in Altoona and Juniata, PA. There were five large railroad yards and numerous smaller yards. The Columbus Geography provided a challenge to moving rail cars and trains between these spread out facilities. The Scioto and Olentangy Rivers coming from the north join together in Columbus with the Scioto River continuing south to Portsmouth. From the Scioto River in central Columbus there is a rising grade in all directions except to the south. In the steam era this required many road freights to have a helper locomotive. Transferring freight cars between yards required hefty locomotives – slow in speed, but capable of starting a heavy string of cars. Freight trains from the west would pick up a pusher locomotive at Grandview Yard before continuing east to the PRR Yard A. At Yard A the road locomotive would be removed and the pusher would finish by either pushing the cars into the receiving yard, which included an icing platform, or over the hump into the classification yard. There was also much interchange traffic between the other four Columbus class I railroads, most often coal hoppers. 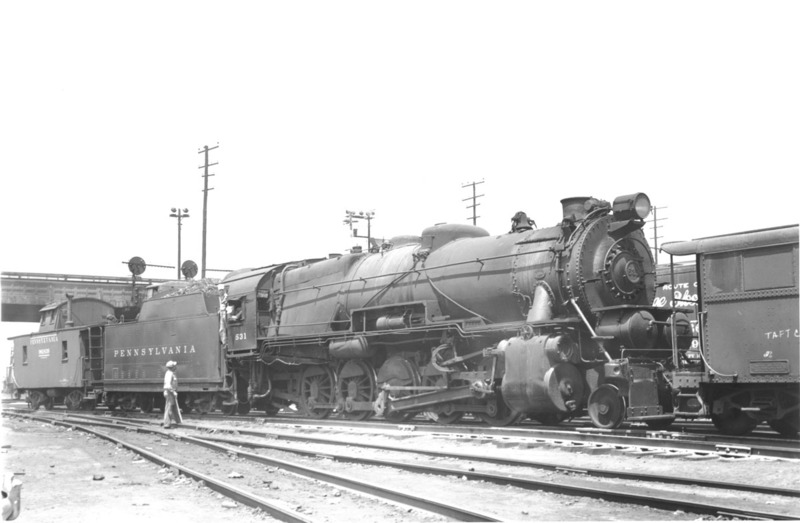 For example the C&O would leave their hopper cars at Grandview Yard on the west side of Columbus. A transfer locomotive would battle the 1% grade to Gorgan Yard on the northeast side in preparation for the trip to Sandusky. It was always a grand show for the local railfans. 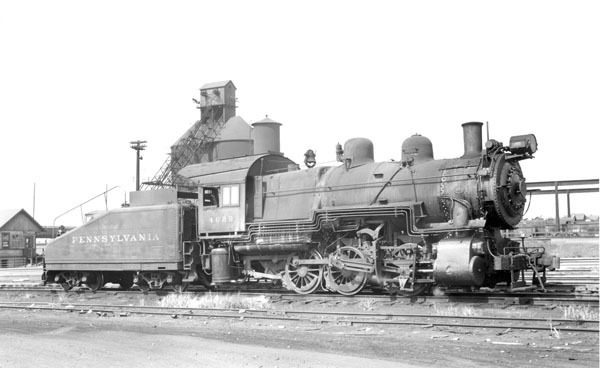 B6sb – 0-6-0 – 238 of these small switchers were built by the Pennsylvania Railroad shops over a ten year period. After WW II the B6sb was used for switching passenger and mail trains around Union Station, the freight house and industries around town. B6sb No. 4029 under steam at St. Clair Avenue servicing facility. The St. Clair Avenue Bridge, coal tipple and crane track girders for the ash dump can be seen in the background. Photo by Donald Etter from the Jay Williams Collection, October 1953. 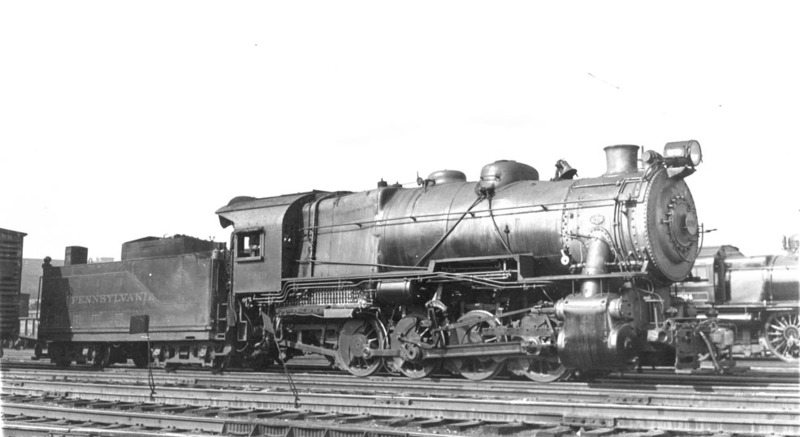 C1 – 0-8-0 – The PRR had 90 of the class C1 switchers. They were the heaviest 0-8-0 type locomotive ever built. They proved unpopular with the roundhouse crew as they were prone to derailing on bad track and to stay bolt leaks. They were used in hump service when there were no other class locomotive available. C1 No. 6610 taken at Columbus. Photo from the Alex Campbell Collection, 1932. H10s – 2-8-0 – In 1947 the PRR had 1194 consolidations on the roster that included over 400 of the H10s class. Originally built for road service the consolidations lasted until the end of steam in 1957. They were use in switching, transfer and local service. H10s No. 8675 in Columbus. Photo by Donald Etter from the Jay Williams Collection, July 1952. 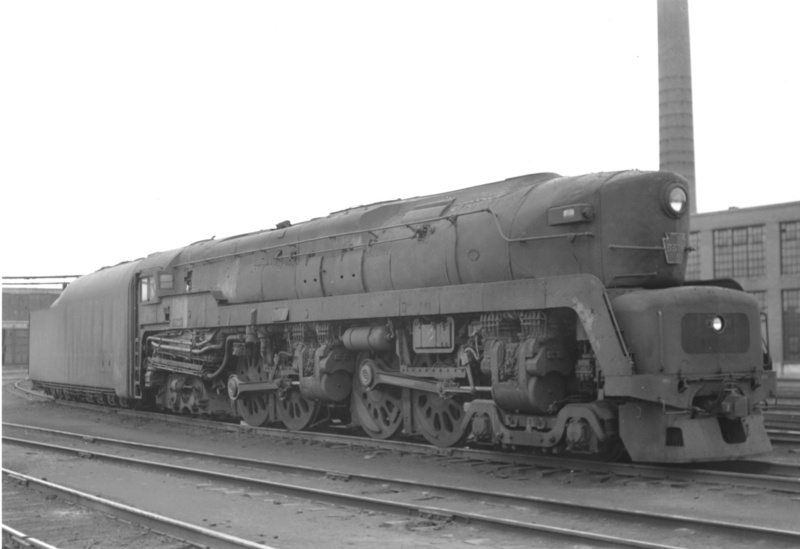 I1sa – 2-10-0 – The I1sa was another locomotive built for freight train service that lasted until the end of the steam era. They were used in hump, transfer and occasionally helper service on the Sandusky Branch. 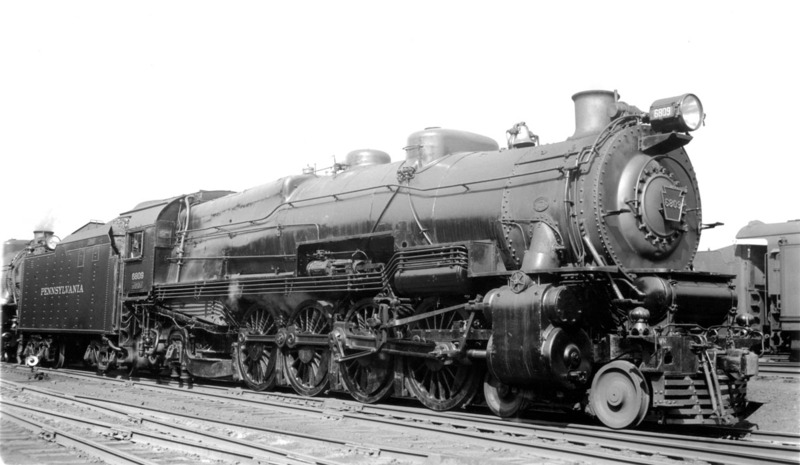 The PRR had a total of 598 I1s locomotives. I1sa No. 531 with the St. Clair Avenue Bridge in the background. A brakeman is conferring with the engineer. CC2 – 0-8-8-0 – There were ten CC2 locomotives all built in 1919. They were not popular and kicked around the railroad until they finally ended up in Columbus transfer and hump service. These articulated compound steamers were powerful and slow not suitable for the road. 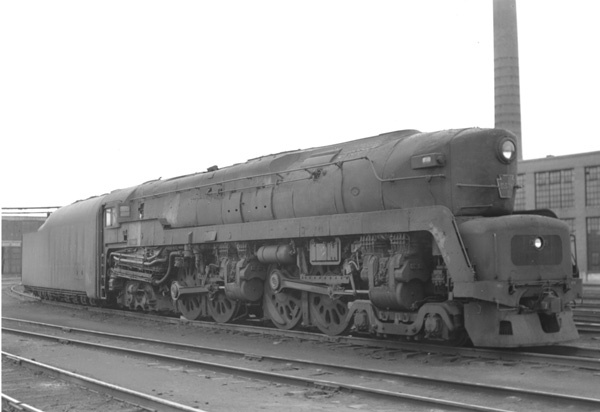 The CC2 class lasted in Columbus until the late 1940s. CC2 No. 7250 in the Columbus yards. Photo from the Jay Williams Collection, 1938. 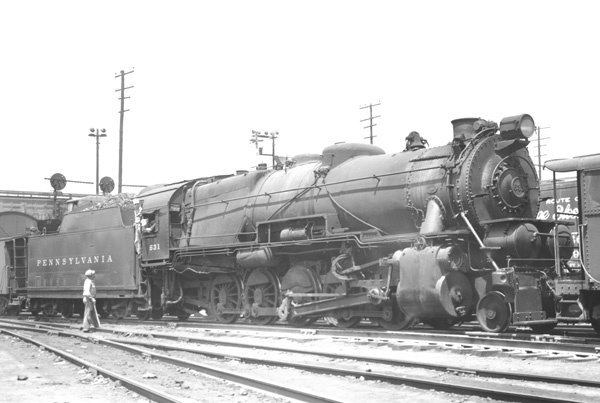 HH1 – 2-8-8-2 – In 1943 the PRR aquired six Norfolk & Western Y3, 2-8-8-2, locomotives all built in 1919. They were used in Columbus for transfer and hump service. They could also be used on the Sandusky Branch as helpers. HH1 No. 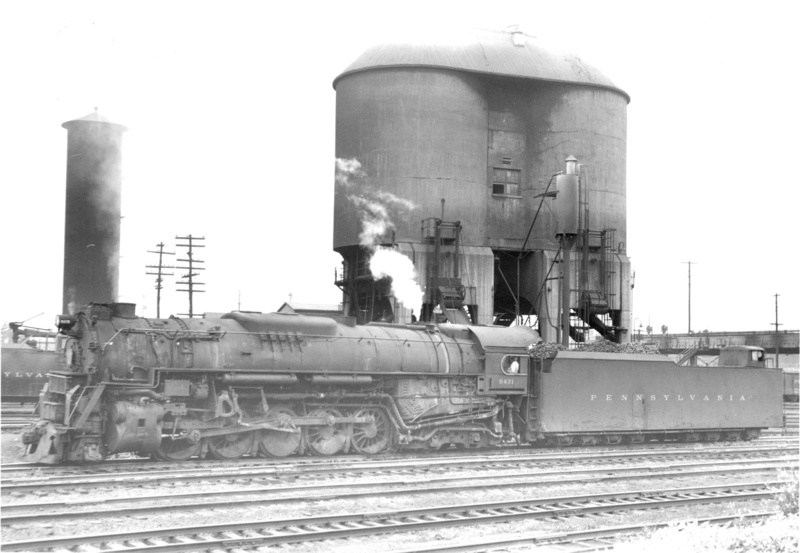 374 with the St. Clair Avenue roundhouse in the background. Photo from the Jay Williams Collection, 1947. 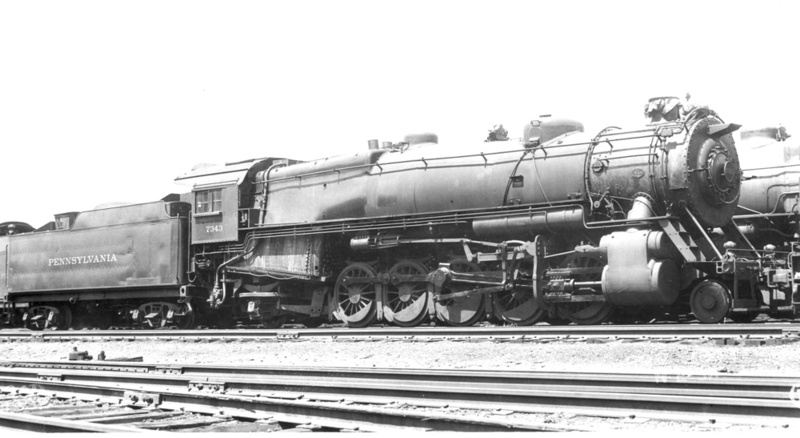 M1, M1a – 4-8-2 – The M1 was a dual service locomotive suitable for both fast freight and heavy passenger and mail trains. 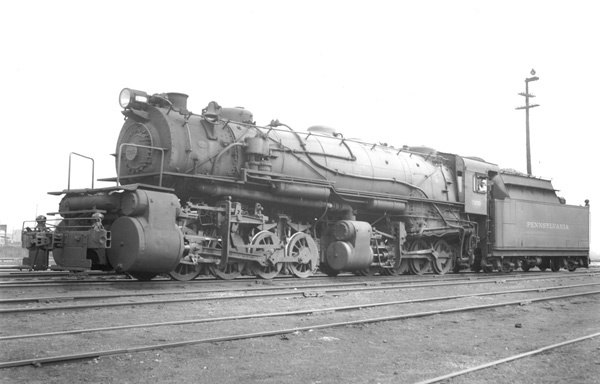 The PRR had 301 M1 locomotives. M1 No. 6809 in Columbus. Photo by R.B. Graham from the Jay Williams Collection, July 1933. 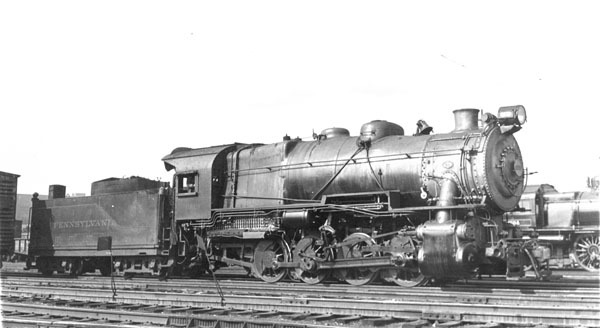 N2sa – 2-10-2 – There were 130 N2s locomotives built during World War I using the United States Railroad Administration (USRA) design. They were used in Columbus on heavy freight trains and were displaced by the J1/J1a and I1sa classes in the early 1950s. N2sa No. 7343 is stored serviceable at Columbus. These locomotives were used on the PRR Sandusky Branch taking coal to the Lake Erie docks. In the winter coal traffic to Lake Erie stopped until the spring thaw opened a new shipping season on the Great Lakes. This could account for 7343 being in storage. Photo from the Paul W. Prescott Collection, June 1932. 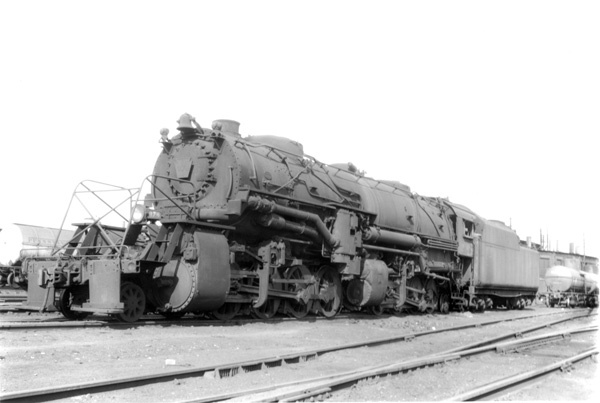 J1, J1a – 2-10-4 – The 125 J class were the largest PRR steam freight locomotives in Columbus. They arrived in Columbus around 1943. They were used on the Sandusky Branch and the Panhandle both west to Logansport, IN and east to Dennison, OH. On the Sandusky Branch a J1 with a helper could handle 125 cars (about 10,000 tons). The helper was dropped off at Lewis Center 11 miles from Grogan Yard. One J1 could handle the 125 cars the rest of the way Sandusky . J1a No. 6431 at the Joyce Avenue coal tipple with the St. Clair Avenue Bridge in the background. This was the last summer for PRR steam in Columbus. Photo by Donald Etter from the Jay Williams Collection, July 1957. 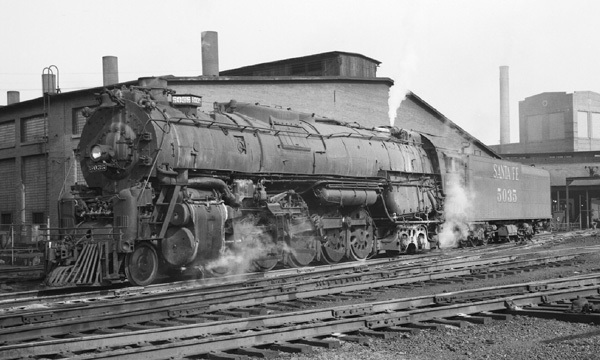 5011 class – 2-10-4 – In 1956 the PRR was short locomotives in the Columbus area. They solved the problem by leasing twelve Texas type 2-10-4 oil burning locomotives from the Santa Fe railroad (AT&SF). The Santa Fe locomotives had a little more heft then the J1 and were noticeable faster climbing the Sandusky Branch grade through Worthington. Fresh from servicing AT&SF No. 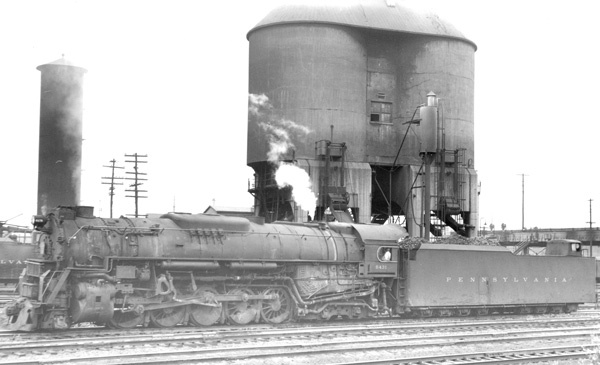 5035 is spotted along side the PRR St. Clair roundhouse. After a fill up of oil and sand it will be ready for another trip to Sandusky. Photo by Donald A. Kaiser from the Alex Campbell Collection, 1956. K3, K4 – 4-6-2 – The work horse of the PRR passenger locomotive fleet was the 425 K4 Pacific class locomotives. They were used on all PRR routes out of Columbus. The K4 lasted until replaced by diesels in the first half of the 1950s. 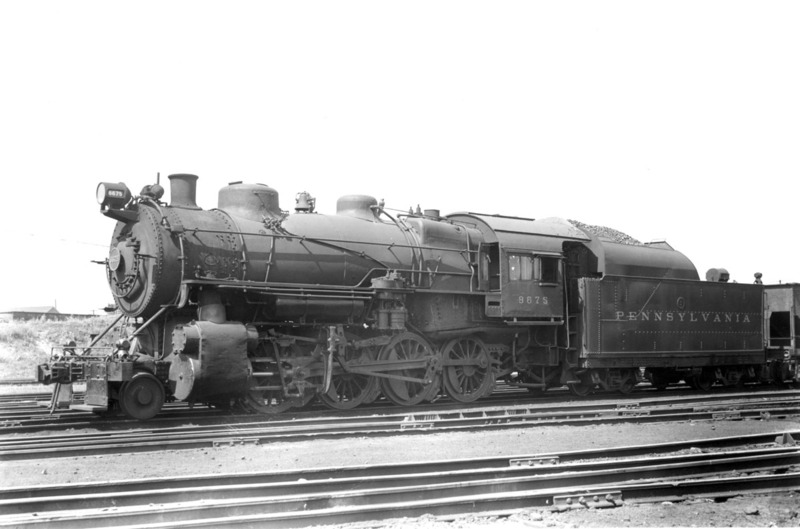 The K3 was a lighter locomotive and might have been used on the CA&C line to Cleveland. K4 No. 20 at the Spruce Street Yard with steam up. Passenger locomotives were serviced at the Spruce Street roundhouse. When steam was replaced by diesel power the roundhouse was torn down, about 1955. 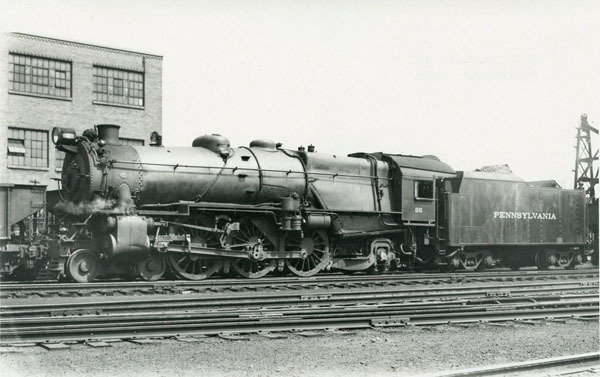 T1 – 4-4-4-4 – The 52 T1’s built during WW II and shortly after were the replacement for the K4. They were faster than the K4 and could pull a heaver train at track speed. Originally they were assigned to the Harrisburg – Chicago mainline via Ft. Wayne. As the PRR dieselized its passenger fleet the T1’s were reassigned to the Pittsburgh – Chicago, Cincinnati, St. Louis via Columbus lines. Often they were assigned to the heavier mail trains. They were only used a few years in Columbus and were placed in storage by 1950 or 1951. T1 No. 5504 at the Spruce Street Yard toward the end of its active service. The roundhouse is behind the tender and the machine shop and power house on the right. Photo by R.D. Acton, May 1952.